It’s been quite a while since I last used my “rock skis”. 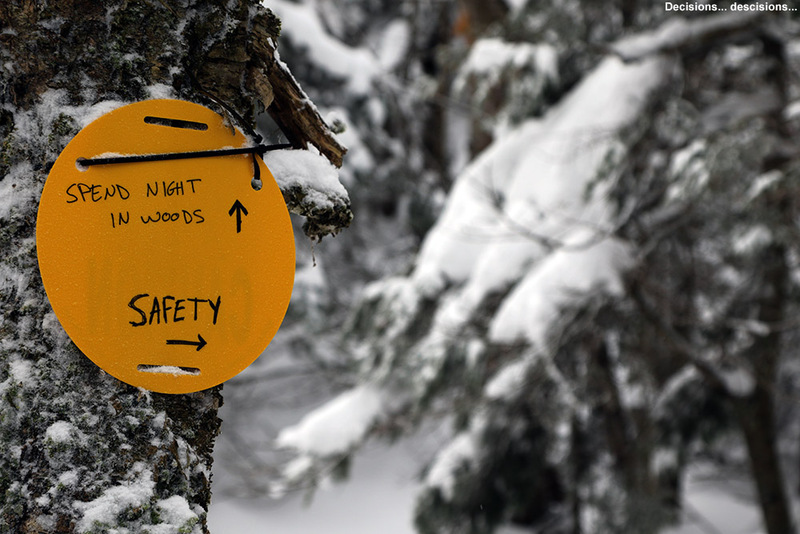 Although I’ve certainly gotten out for many early- and late-season turns over the past several seasons, I just haven’t had to worry much about conditions that were going to damage my skis. 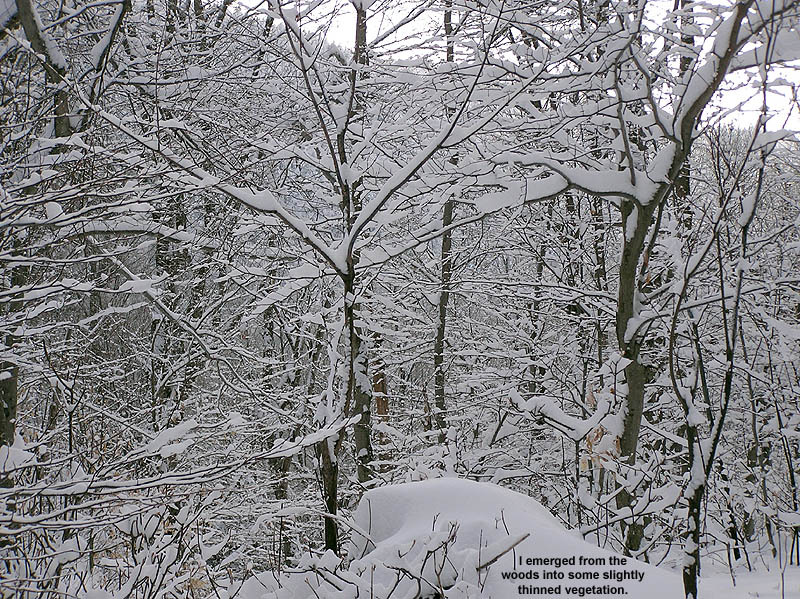 Late-season snow is dense, for the most part covering rocks where it’s present, and our early-season storms of late have generally been substantial enough that I wasn’t concerned about rocks on the terrain I was skiing. This year has been a bit different here in the Northern Greens though, and rock skis turned out to be just the right choice for today’s outing. We’ve had numerous rounds of snow in the mountains over the past couple of weeks, but none of the storms have been the type that really put down a big dump of 6 to 12 inches or more at once. New Hampshire did get a big shot of snow from the last storm that hit, but over here in the Greens we’ve just been adding an inch or two here and there. 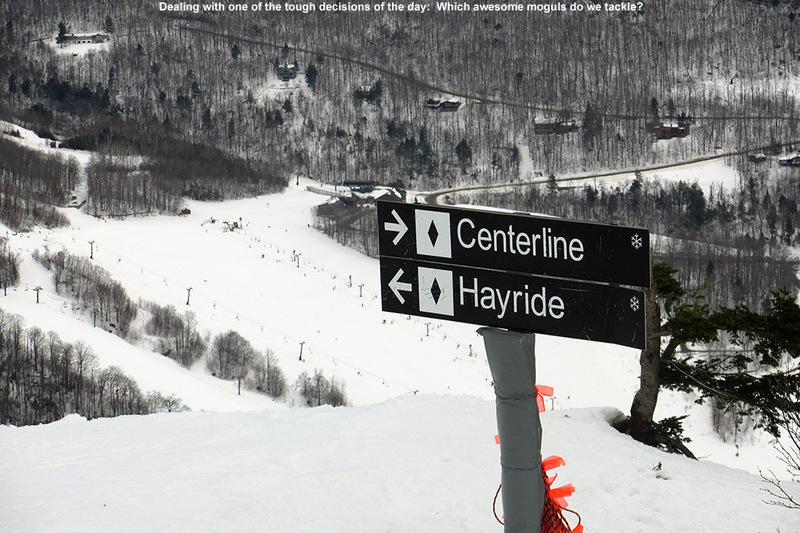 Those smaller bouts of snow have added up over the past couple of weeks though, and with the nor’easter affecting the area today, it finally seemed like it would reach that threshold of base depths to lure me out to the slopes. 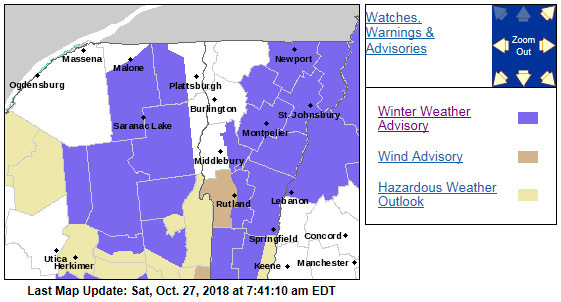 There wasn’t a lot of cold air around ahead of this nor’easter, so the forecasts called for at best a few inches of snow in the higher elevations. 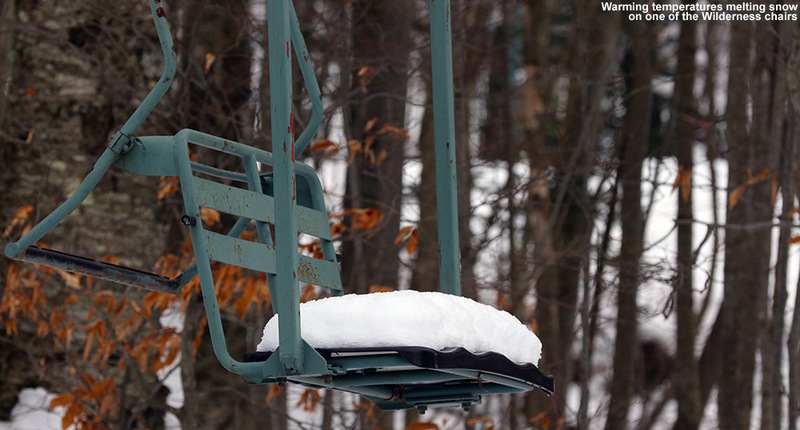 Based on Powderfreak’s Stowe reports however, there were 3 to 5 inches of snow already on the slopes at Stowe, and even a couple more would be enough to get me interested in checking out the potential for some turns. 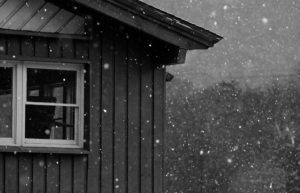 As the nor’easter approached, snowfall at our house in Waterbury began mid-morning, and then in the midafternoon Mother Nature really turned on the spigot and we got into a period of heavy snowfall composed of big wet flakes up to 2 inches in diameter. With the heavy snow falling it seemed like as good a time as any with respect to catching any new accumulations on the slopes before any potential mixed precipitation. I was planning to take an initial look at Bolton Valley to see how the snow was up there, but the Bolton Valley Access Road still hadn’t been plowed as I started up, so I didn’t go very high before I decided it was best to turn around. There was no way I wanted to try heading all the way up to the Village above 2,000’ on an unplowed road. In line with my plans, I next headed off to Stowe for some skiing, and I was fairly confident that the driving would be fine with the route at mostly low elevation. 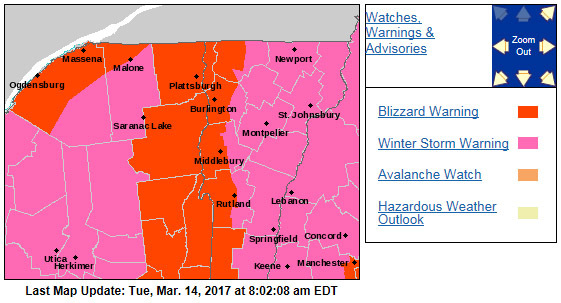 Indeed the driving was fine, and unlike Waterbury, the town of Stowe really hadn’t picked up any snow, so that made the drive very easy. Rain through the valley switched to mixed precipitation as I approached the base elevations of the resort at 1,500’, and I found a solid covering of 1 to 2 inches of snow on the ground at the Mansfield Base Lodge where I parked. I’d brought two pairs of skis and skins, and after surveilling the area I decided that the rock skis were the way to go for a more enjoyable descent because I wouldn’t have to work too hard trying to avoid any rocks. I wanted some mellow, grassy slopes for my tour, so I headed up in the area of the Mountain Triple Chair toward the Stowe Mountain Chapel. The mixed precipitation that I’d found when I first arrived changed over to all snow as I began my ascent, and I really needed the hood of my coat at times due to the intensity of the precipitation. I quickly found 3 to 4 inches of snow on the grassy slopes, which is about where the depth stayed up to the Mountain Chapel at ~2,300’. Although I could have used my skins, I never really needed them because once I got up to the Crossover road I was able to simply walk in my Tele boots easily. I really thought that the grassy slopes would offer the best skiing, but it turned out that the service roads were the best. Up by the Mountain Chapel, the 3 to 4 inches of dense snow on the smooth surface of the Toll Road really produced some excellent floaty turns. The Crossover Road isn’t nearly as smooth, and the snow depths did drop a bit on the descent, so nothing compared to the turns up on the Toll Road. On the grassy slopes, the depth of the cut grass relative to the few inches of snow, combined with my fairly skinny rock Tele skis, made turns much more challenging. I was low enough down in the grass that there was substantial resistance to making any short-radius turns. The snowfall had let up for the most part by the time I’d descended back to the base, but the weather show wasn’t quite over. 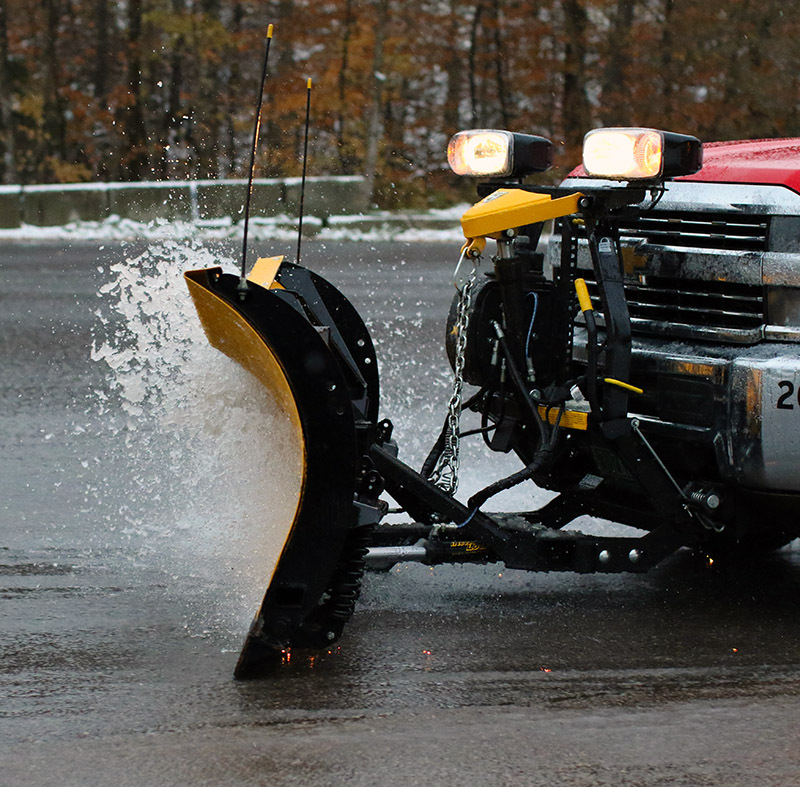 I got to see some plowing of the parking lot, and the slushy snow was so wet that it was almost as if the plow was simply plowing water! This was the 4th storm with accumulating snow at our house this October, and based on my count, it was the 6th storm with snow for the mountains, so we’ve really had quite a run. 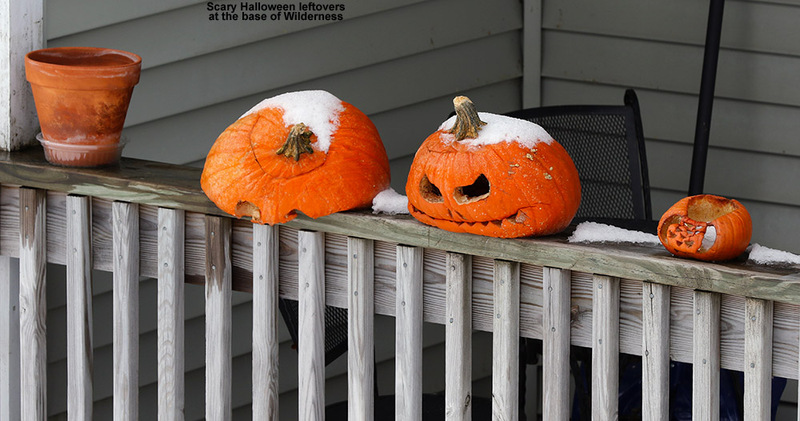 It might not be the last of our October snow though; we may get a couple of chances through midweek before we get into a slightly warmer pattern heading into November. 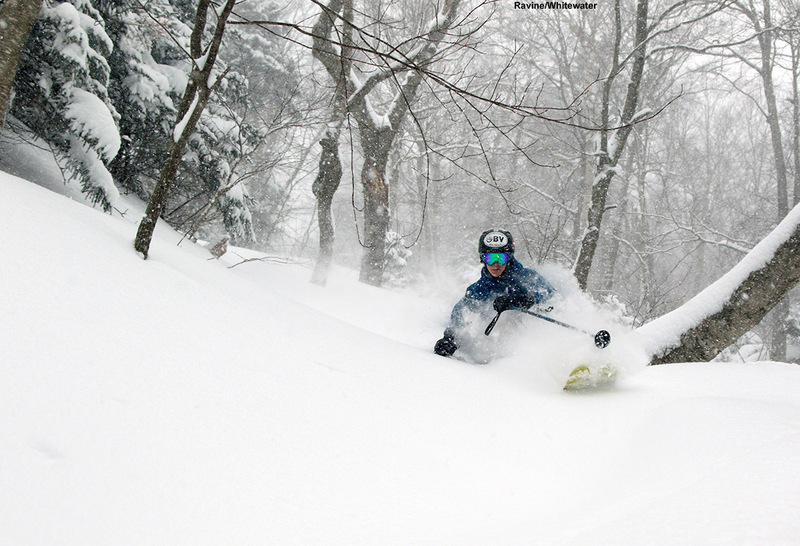 After some simply fantastic ski conditions during the first half of February, temperatures warmed up in the Northeastern U.S. and everything changed. 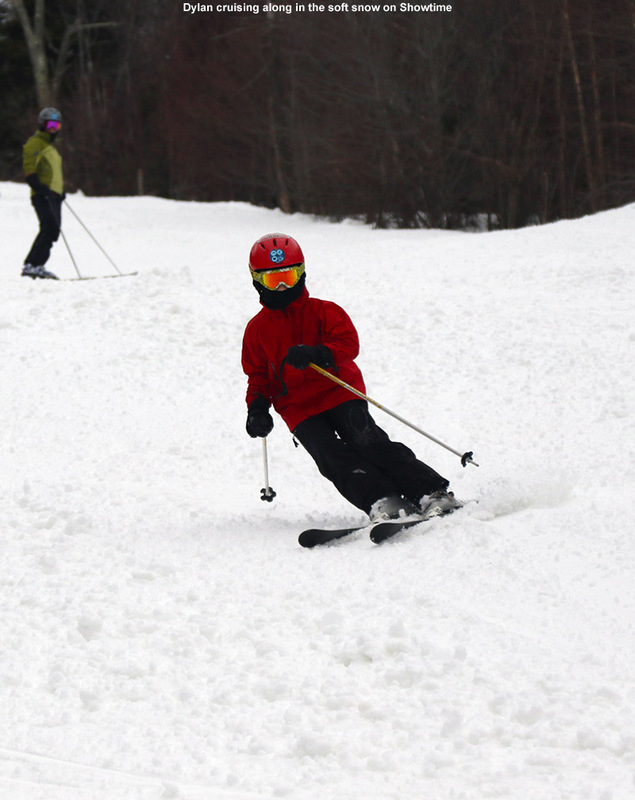 The result was actually some nice days of spring skiing, but as temperatures cooled back down and no winter storms with substantial snow came through the area, conditions were just generally hard and crusty. 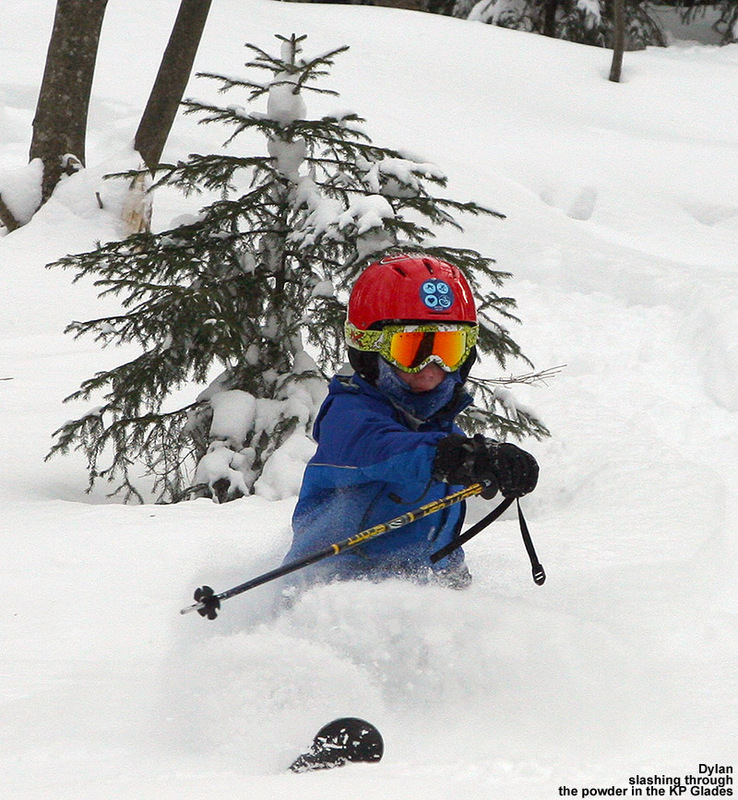 It’s amazing that it took until mid-March to really get the ski conditions back on track, but boy did they come back in a big way thanks to one heck of system named Winter Storm Stella. Some of the biggest nor’easters are actually picked up fairly early on the weather models. These very large storms are associated with an alignment of such prominent weather features that they produce a signal that the models can really key in on. 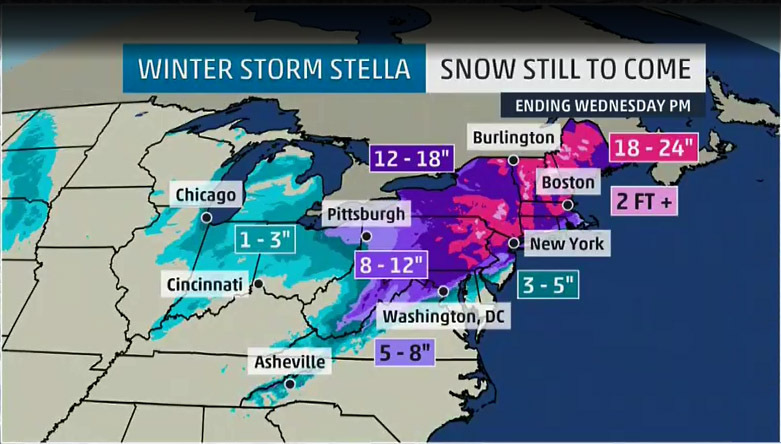 That was the case with Winter Storm Stella. The buildup was impressive on the weather boards and in the national media, and although it didn’t deliver massive amounts of snow to the big coastal cities in the Northeastern U.S., areas farther inland (such as Northern Vermont and Upstate New York) made out like gangbusters. 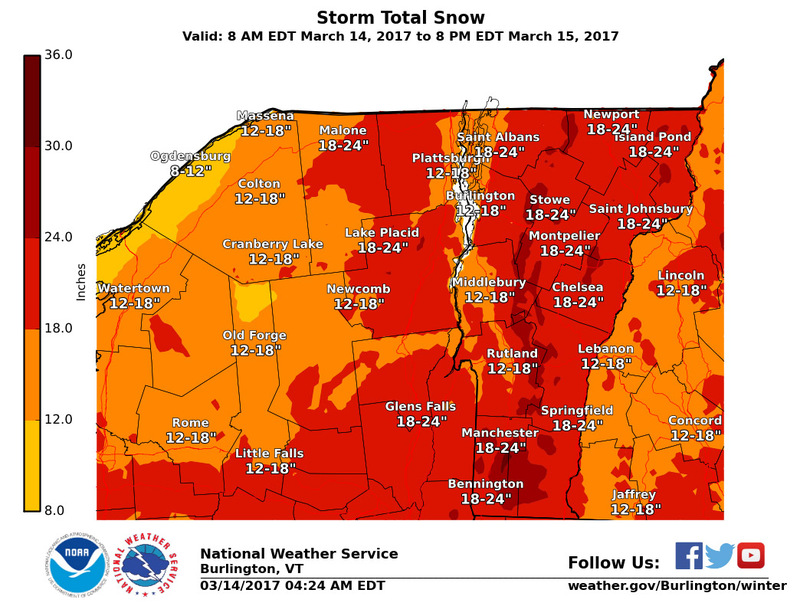 Reports were coming in of over 40 inches of snow in Upstate New York, and the Vermont resorts. 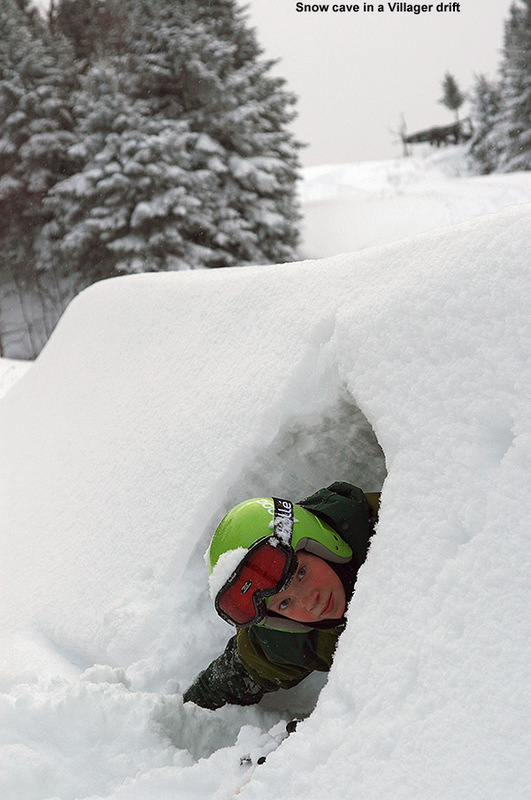 Unfortunately Dylan was a bit under the weather today with a cold, and while he was bummed to miss out on some great powder, he probably made the right decision to stay home and rest up with the way he felt. Although he could stay home alone, E felt that if she was home with him he’d do a much better job of taking care of himself. 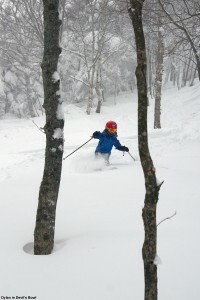 So, Ty and I headed off alone to Stowe for some turns this morning. It was still snowing steadily at the house when we left, but the roads weren’t bad because the plows were out working hard. In terms of snow accumulations and snowfall rates around the area, they tapered off somewhat as we headed from the house to Waterbury and Waterbury Center, and surprisingly, snowfall rates dropped to just flurries along the Stowe/Waterbury line. That was the nadir in terms of snowfall intensity, and then it gradually ramped back up as we headed through Stowe Village and up to the mountain. We decided to focus on the Gondola terrain today, so we parked in the Midway area, and got suited up in the Midway Lodge. There were very few people in the lodge at that point, which was probably a good sign with respect to crowds. At the Gondi, the lift queue was a few minutes long, but that’s really not bad for such a storm day. 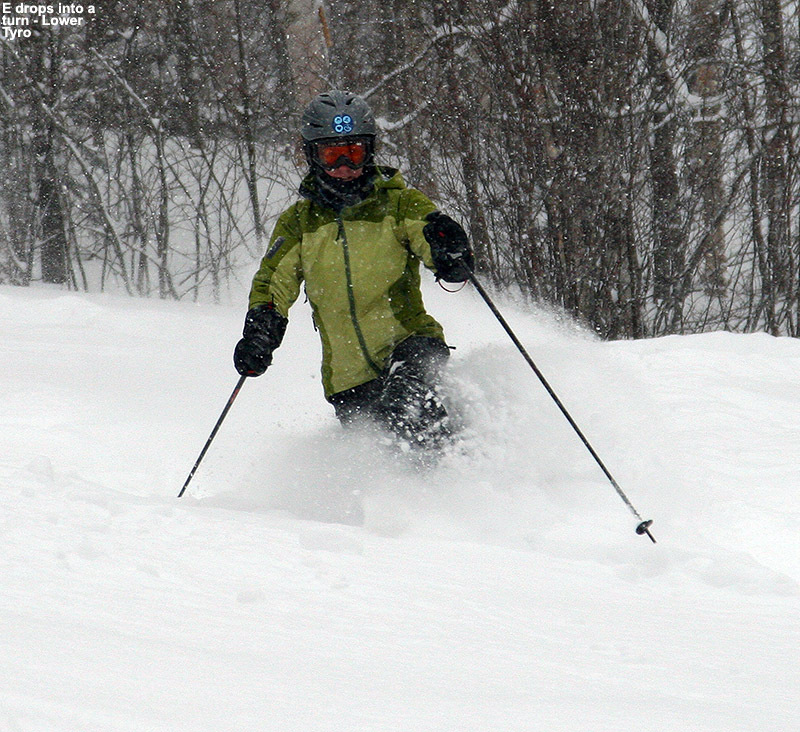 As one would expect, the skiing was simply fantastic – surface powder depths we found were typically 18 to 24 inches, with sheltered spots hitting 30 inches. This storm gave the whole resort quite an impressive resurfacing. We started off with Waterfall, and then headed to Gondolier and eventually we found ourselves on Ravine. That’s where we started getting into the untracked powder, and boy was it deep. We’re talking white vest-wearing, powder cascading over the shoulders deep. It was actually pretty easy to get buried in the snow if you fell, so we were definitely watching out for each other. 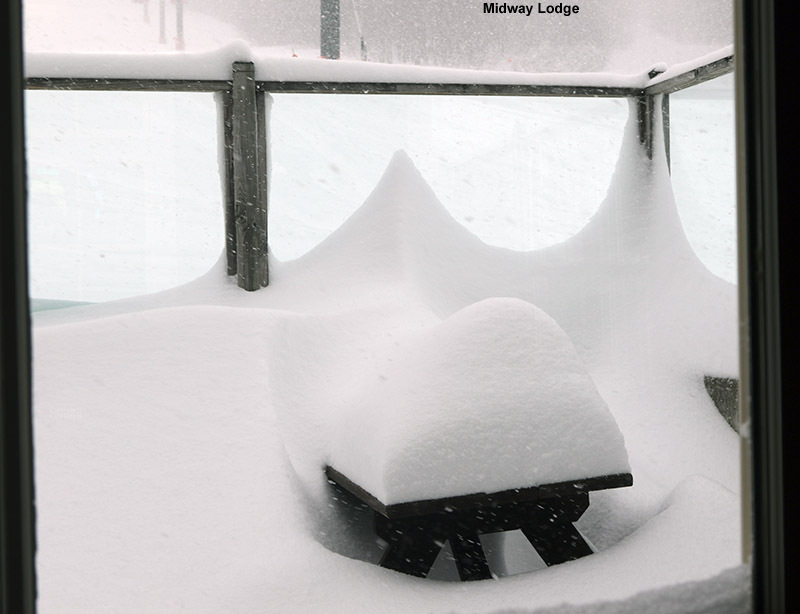 We’d skipped breakfast to save time, with the intention of getting it at the Midway Lodge. So, we stopped in quickly for a couple of really good breakfast sandwiches, and then got right back into some additional Gondola runs. 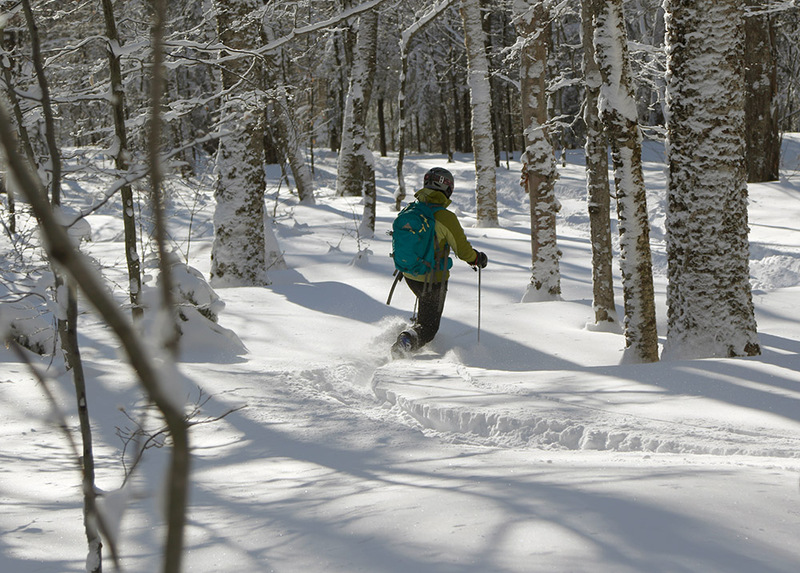 We actually spent a lot of time over by Perry Merrill skiing the powder along the sides of the trail and exploring new terrain along the edge of the Hazelton Zone. 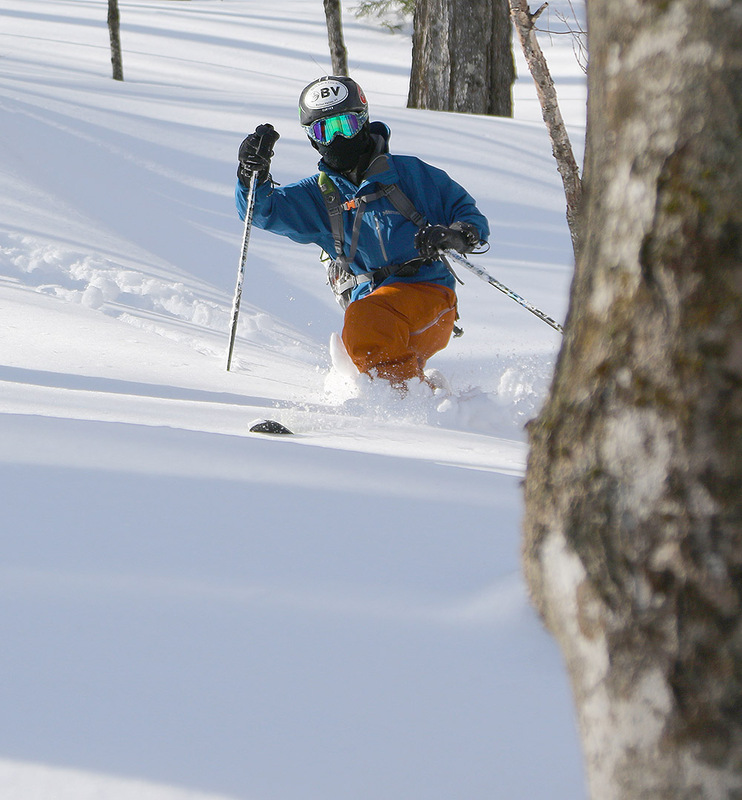 We found a lot of untracked shots, and I pulled out the camera for some of our favorites. On our last run Ty blasted me with a massive wall of powder and covered everything, my clothes, my camera, my open bag, all of it. He described what I looked like all covered in white with my mouth agape. 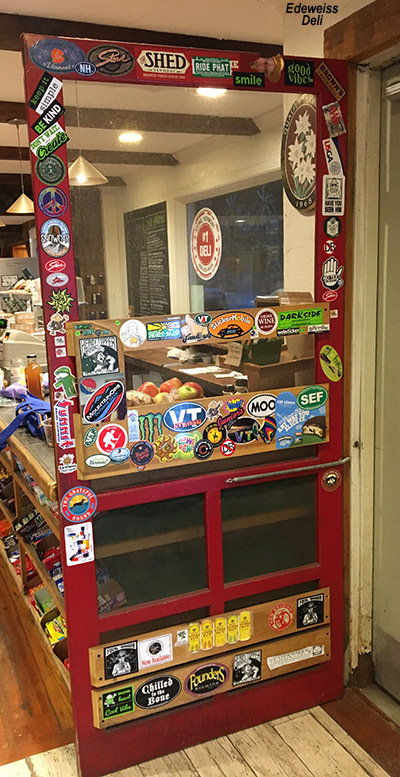 We stopped to grab some sandwiches for lunch on the way home at Edelweiss Mountain Deli, one of Ty’s favorite options. 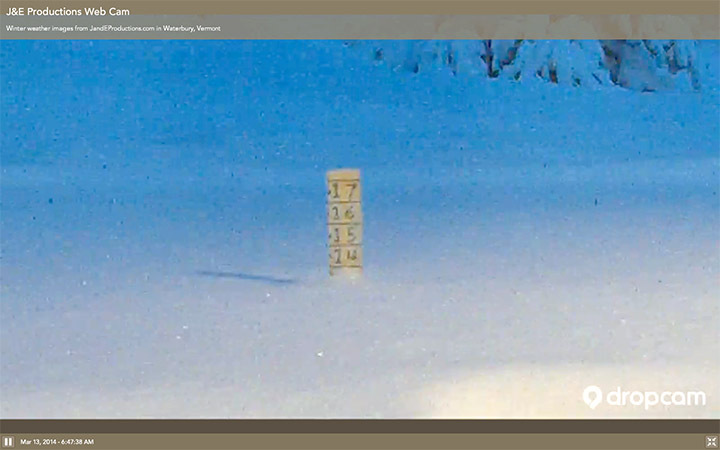 I could tell that it continued to snow at home because I’d check on our web cam while riding the Gondola, and watched it as the snow got so deep that all the camera could see was white. The settled snow on the deck is now deeper than the level of my web cam, but I pulled away some snow and adjusted the angle so the settled height of the snow is once again visible. 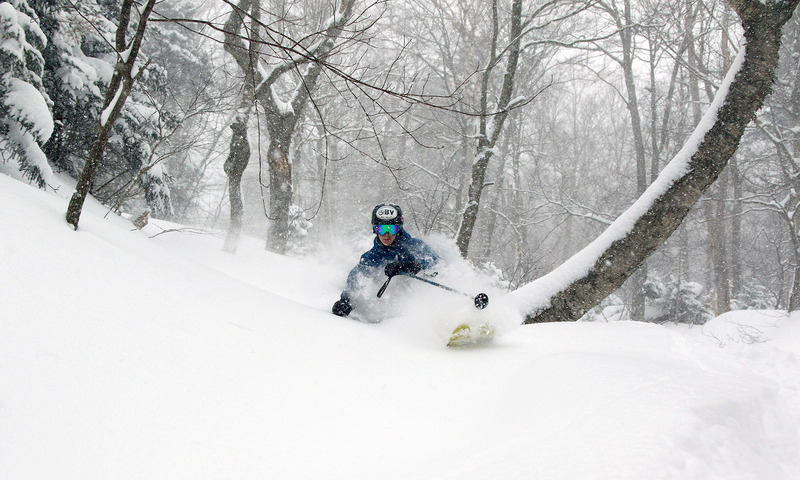 As of this evening, we’re approaching 40 inches of accumulation at the house, and earlier, Jay Peak was already reporting 72 inches of accumulation, so Winter Storm Stella has been quite the event around here. 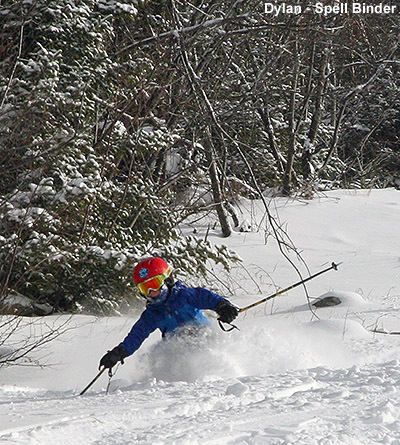 We’ve had some good snows over the past several days courtesy of the Thanksgiving Nor’easter that dropped about a foot at the Vermont ski areas, and a smaller upper level system that came through a couple days later and delivered a few more inches to the Northern Vermont resorts. We were traveling a lot visiting family during the timeframe of the storms, but we had a chance to head up to Bolton Valley and check out the snow today. Temperatures began to push above freezing this morning, so I knew that the powder was going to be getting a bit heavier, but it still seemed like it would be worth a quick trip up to the mountain. 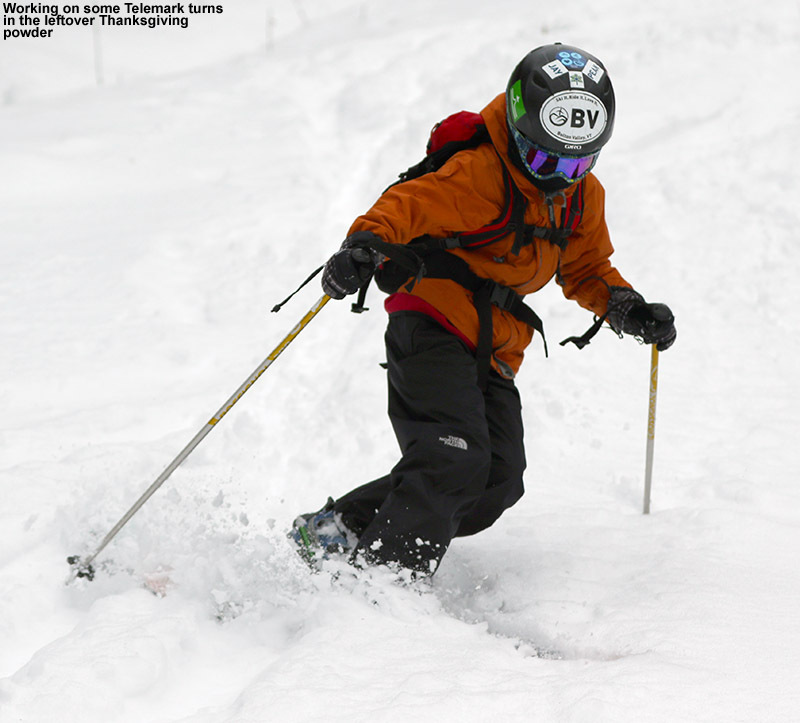 Ty was anxious to try out his new Telemark setup, so he certainly wanted to go, but knowing that the powder was going to be on the heavy side, E and Dylan decided to hold off for better snow and get some other stuff done instead. 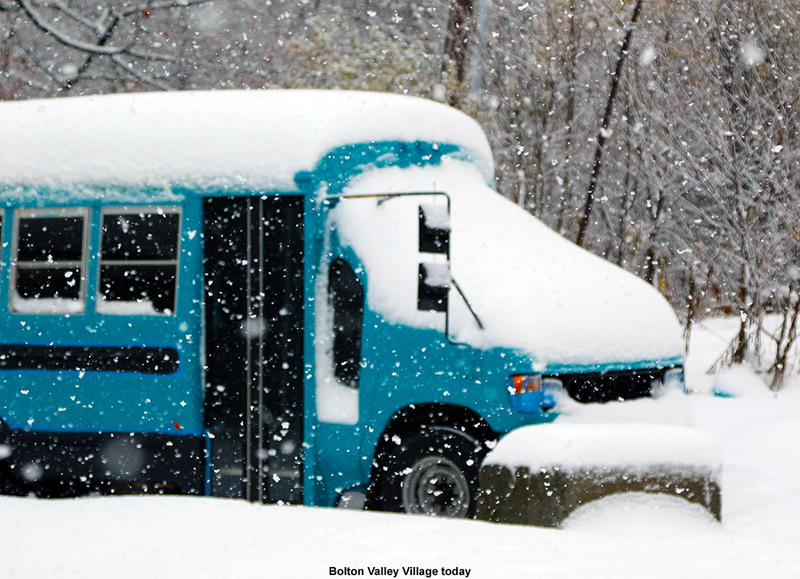 Temperatures were already a couple of degrees above freezing when we arrived up at the Bolton Valley Village and made our way over to the base of Wilderness where we found 6 to 7 inches of snow. 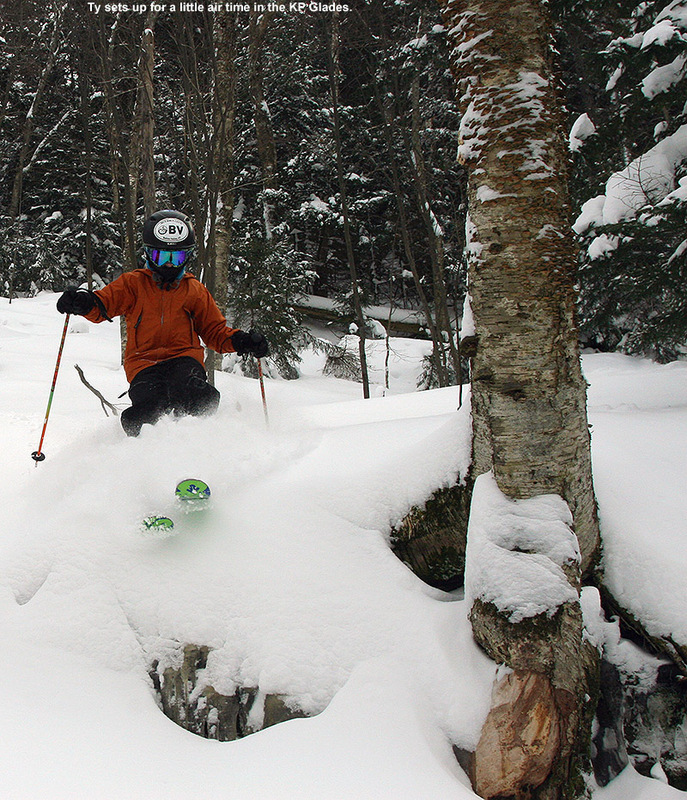 There were a couple of nice skin tracks in the Turnpike area, and the ascent went smoothly. 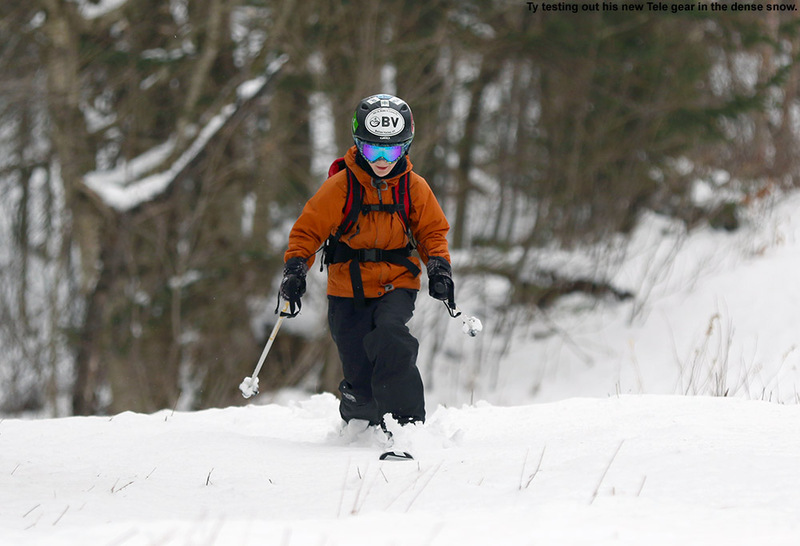 Ty really enjoyed the free pivot on his Voile Switchback bindings for the ascent – he’s been waiting for a while to have bindings with that feature. We stopped our ascent on Old Turnpike before the pitch got to steep to support decent skiing with the available snow – there was actually about 10 inches up there, but there’s not much base yet, so steep, rockier pitches would definitely be rough on the ski bases. As always, there were interesting sights along the tour. The descent was fun, but a bit slow at times with the snow density increasing. Ty did well working on his Telemark turns, and having handled this dense snow, we both agreed that he’s really going to have a blast on his new gear when we get some higher quality powder. He’s got the Switchbacks mounted on a pair of the 2014 Völkl Gotama Junior skis, and at 118-86-111, these are actually a bit wider than previous versions of the ski that he’s had, which were more in the range of 113-80-105. 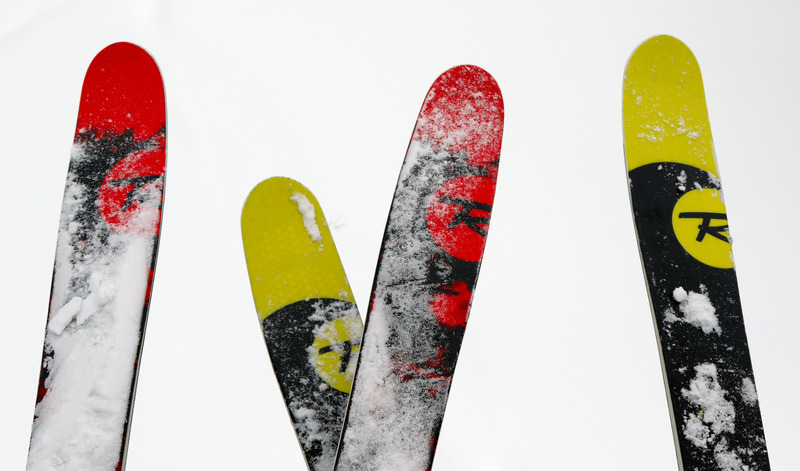 These later versions may even have a bit more rocker in them, but in any event, they look like they’ll be great skis for powder. We stopped in at the Bolton Valley Deli & Grocery to grab a bit of food before heading back down into the valley, where the temperature had climbed into the upper 30s F. Although not great for the powder, these temperatures have really made clearing the snow from the driveway easy – it’s mostly gone simply from melting by warmth from above and below, so we haven’t had to shovel at all except for the berm left by the plow along the road. 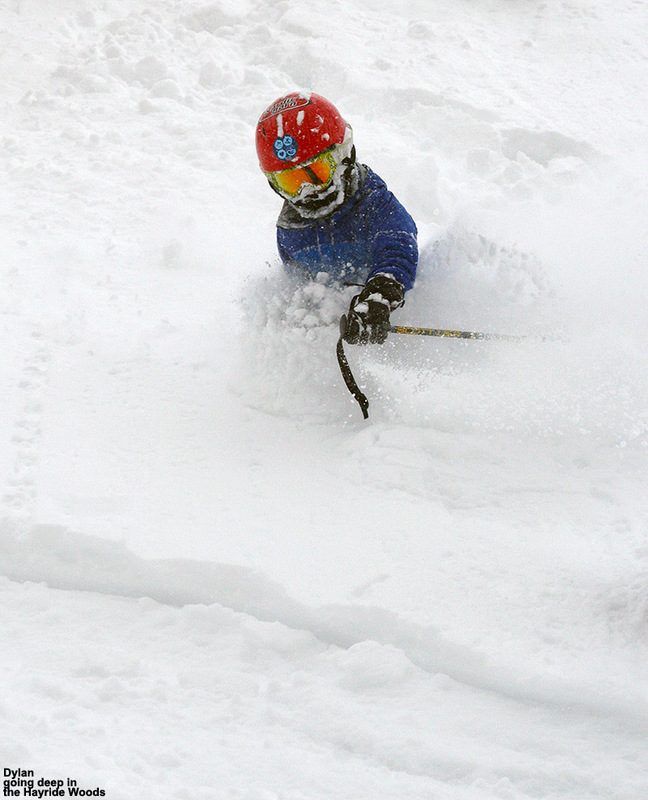 The latest nor’easter had delivered about a foot of fresh powder to Stowe by the end of the day today. 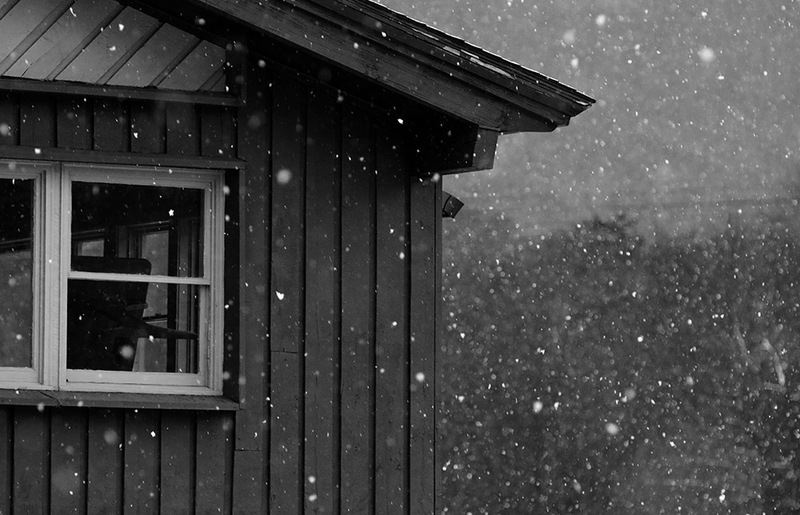 This morning I awoke to the first accumulation of snow from our current nor’easter. 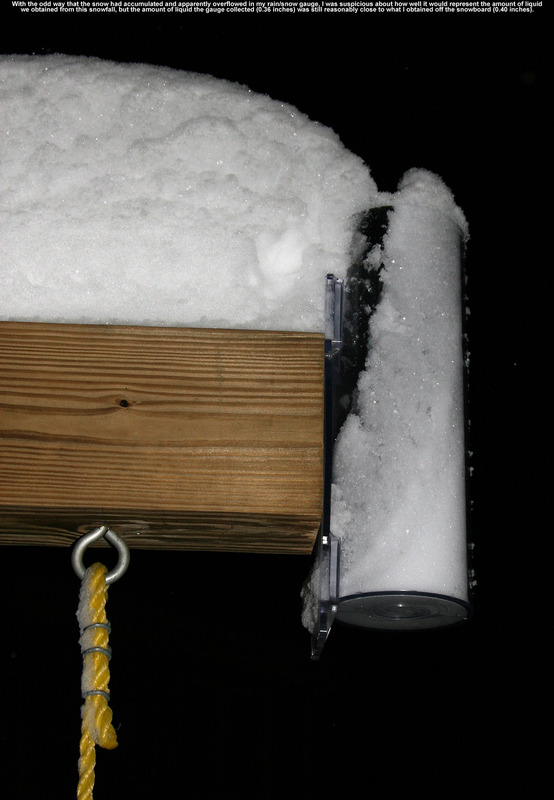 My early estimation was that there were 3 to 4 inches of snow on the snowboard, and that was pretty close, with 3.8 inches measured for my 6:00 A.M. CoCoRaHS observations. 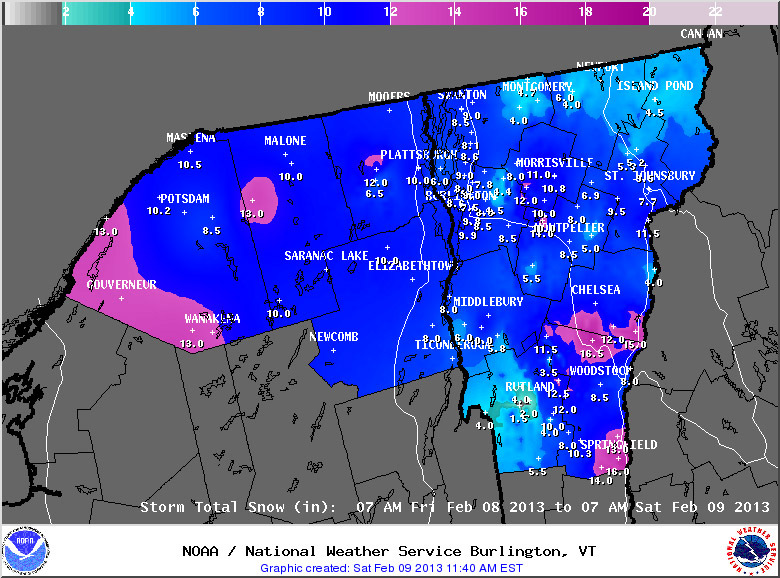 Once reports from the Vermont ski areas started coming in, the trend was ~6 inches in the northern resorts, and 8 to 9 inches at the southern resorts. E and the boys eventually got the word that school was cancelled for the day, which meant it was time to decide where to ski. 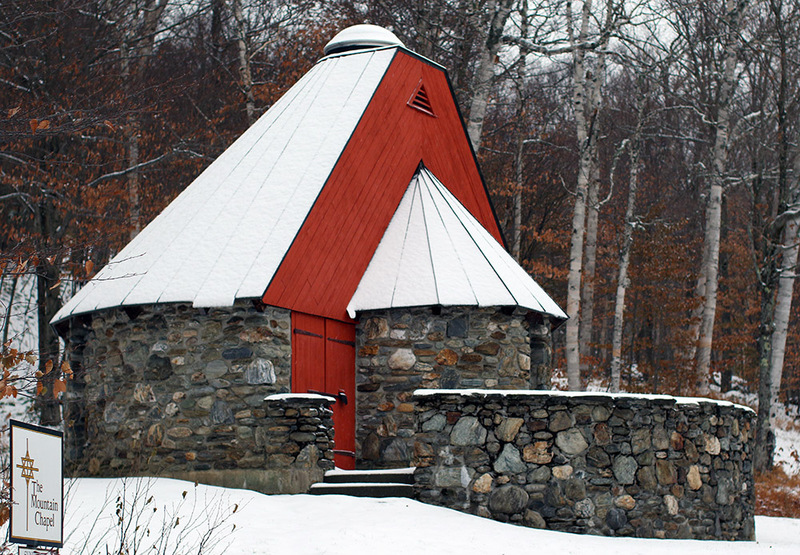 E was initially leaning toward Bolton for the shorter drive in the snow, but we found out that Claire, Luke, Jack, and Madeleine were going to be at Stowe, and that shifted the balance. 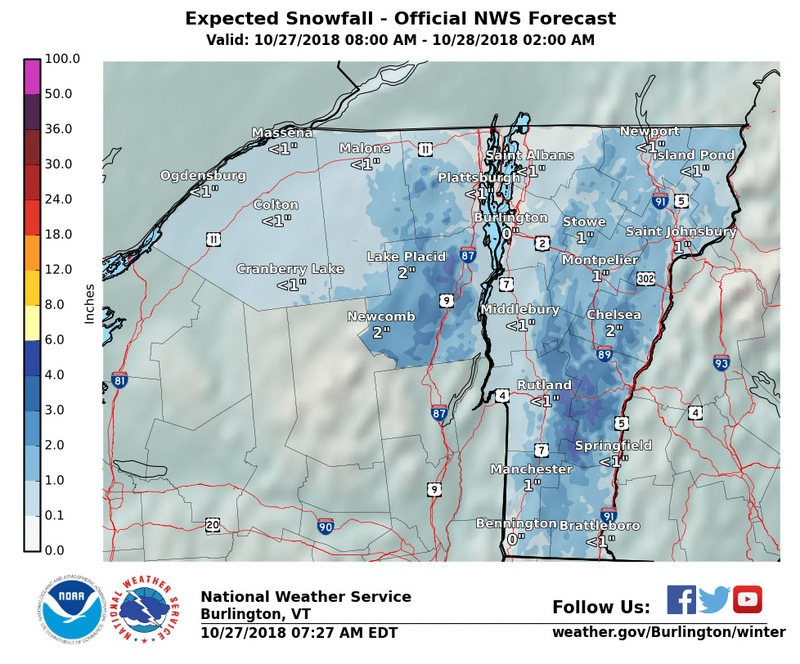 After the initial overnight snowfall, precipitation slowed down for the first half of the morning, and then resumed with greater intensity around mid morning. It was starting to coat the roads again as we made our way to Stowe, but the driving conditions were still decent. 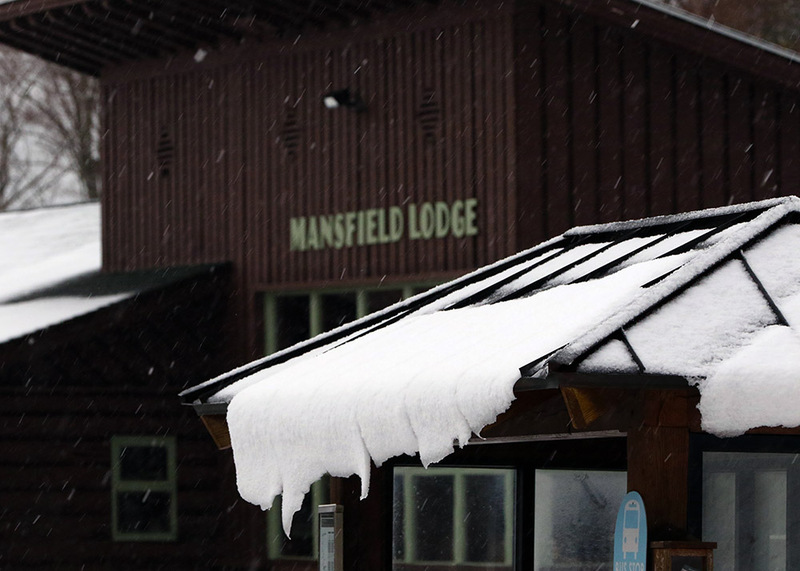 Based on the day’s ski plans, we parked over by the Mansfield Base Lodge for the first time this season. The scene had that retro flair, complete with a train of classic, bluesy rock playing on the audio system. 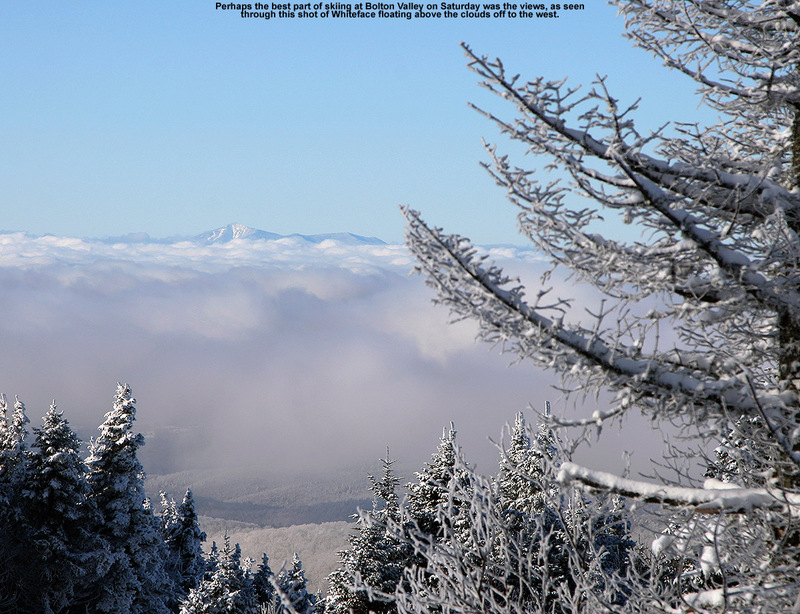 Stowe had indicated about 5 inches of new snow in their morning report, so I decided that we’d focus on some moderate angle terrain for a bit and see where that led us. We’d had such success with areas like the Chapel Glades and various surrounding trees, that it seemed like a good place to start. From the summit of the Fourrunner Quad we made our way down some of my favorite mellow routes in the Toll Road and some of the Upper Sunrise Glades. We explored a new route and found that there has been a LOT of off season work done in those areas. 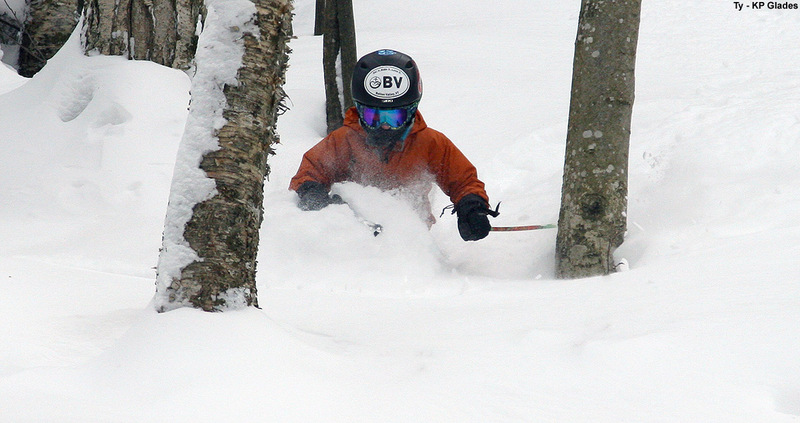 We followed that up with a trip through the Chapel Glades, where E was having a lot of fun on here Teles. 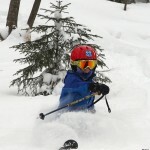 E’s favorite part of the run was probably when we dropped into Lower Tyro and found very few tracks, just vast areas of fresh powder at a nice pitch for powder skiing. 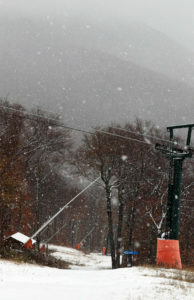 As an added bonus, the sky was just unloading snow on us at that point with some of the heaviest snowfall of the day. 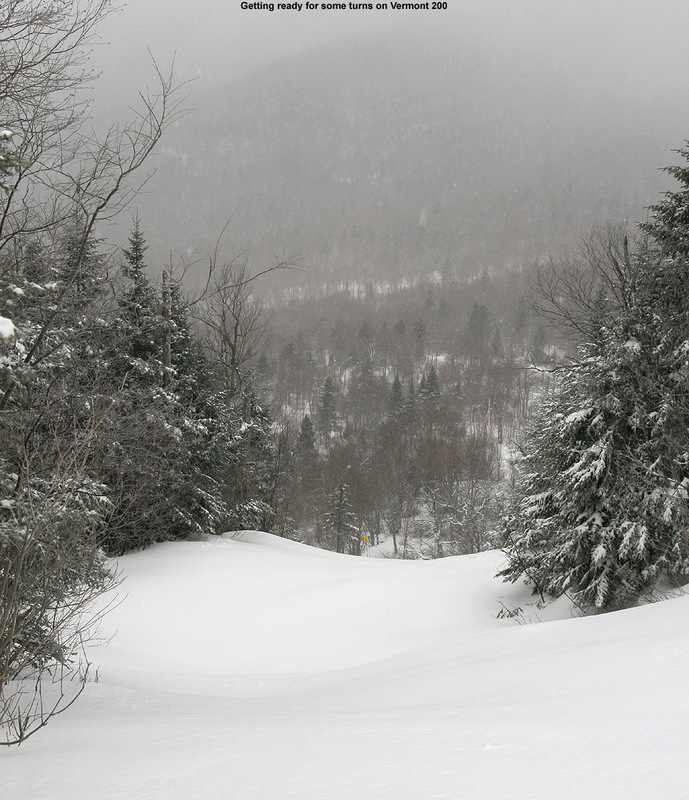 We followed that up with a run from the Mountain Triple, where we traversed even farther before dropping into the Chapel Glades and found that there had been a lot less traffic. Dylan was ready for lunch at the bottom of the next run, so we hit the Mansfield Base Lodge, and we were pleasantly surprised by the variety and quality of food that they had available. 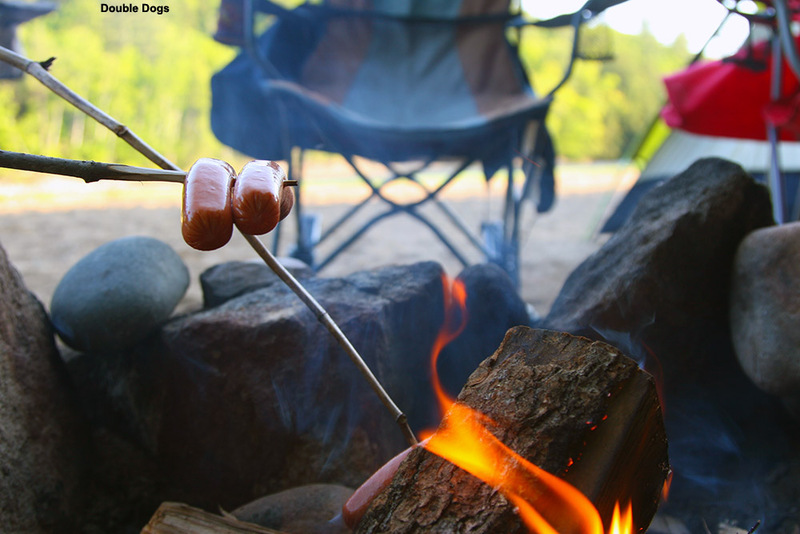 Once you get used to the plethora of great options at the Great Room Grill, other dining spots might seem limited, but there was a good selection at the ‘ol Mansfield Base Lodge. I got the soup of the day, which was corn chowder, in a bread bowl, and E and I were able to share it. Claire called while we were eating, and by the time we were finishing up, she and her crew had arrived. We decided to show everyone what we’d been skiing in the morning, and varied it by pushing even farther into the Upper Sunrise Glades toward a line we’d seen from below. It was quite steep at the top, which got some of the boys like Ty excited, but meant a bit slower going for Madeleine. In subsequent runs we hit some of the Hayride Woods that we’d wanted to try and finished off the day visiting Duck Walk and the half pipe. We actually had to start picking up the pitch of untracked terrain as the day wore on, because the powder was getting deep enough that the gentler terrain wasn’t quite cutting it. It’s a good sign that the subsurface is getting covered. It’s been quite fun exploring the far southern side of the resort after so many days earlier this season in the northern areas. Overall it was a sensational powder day, since temperatures were comfortable and there was little if any wind away from the highest elevations. 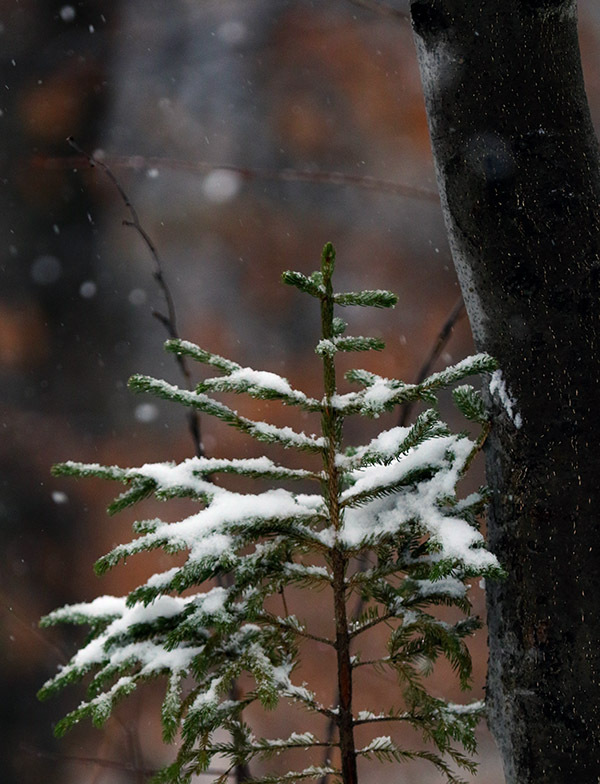 There were numerous times today where we enjoyed the silence that comes from heavy snow in the air. 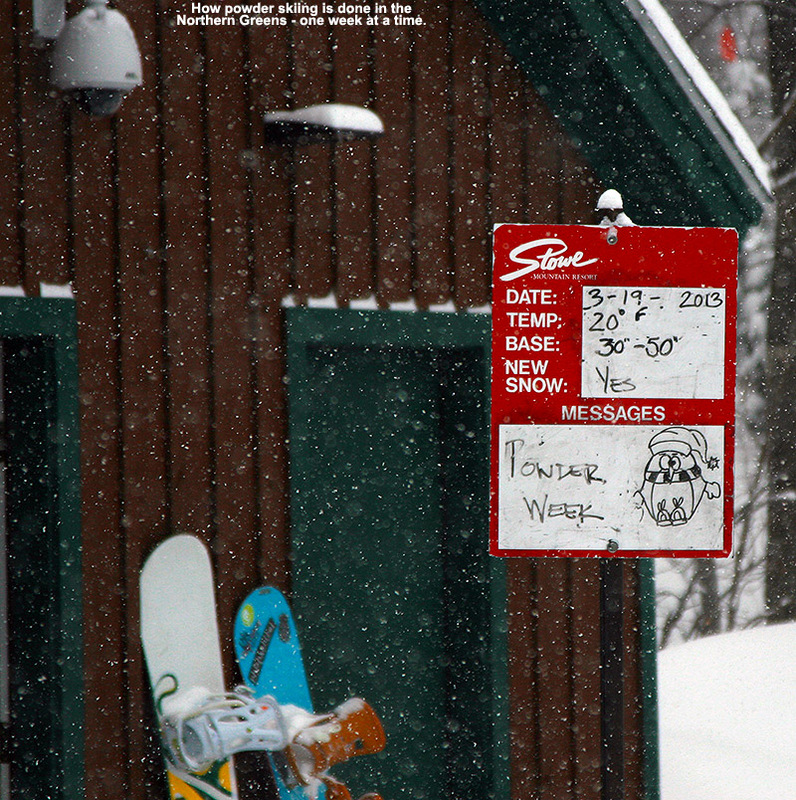 It looks like this snowfall could continue for quite a good period this week, and Stowe actually had a sign at the bottom of the Fourrunner Quad indicating not just a “powder day”, but a “powder week”. That’s a good way to run a week. The Mt. 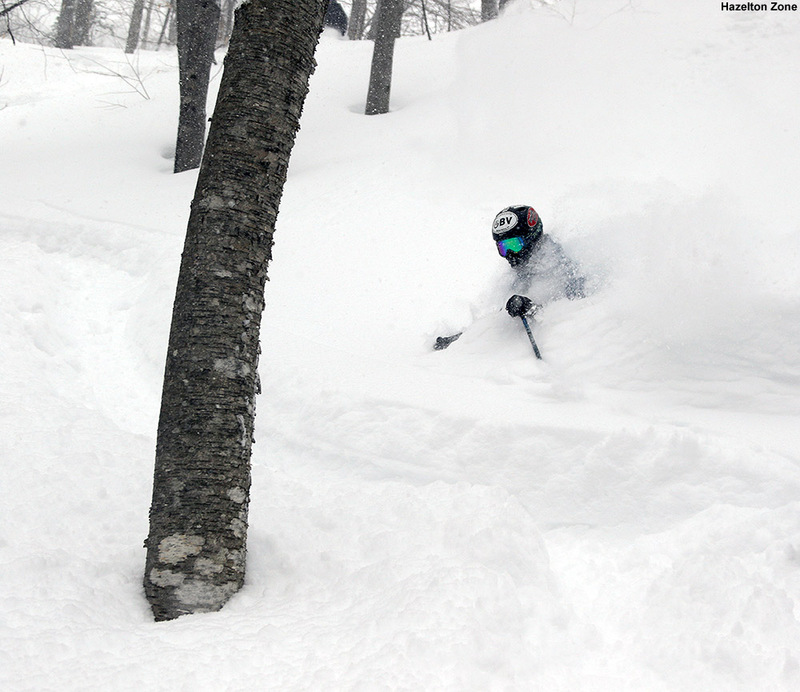 Mansfield Stake hit 70 inches today, which is the highest it’s been this season. 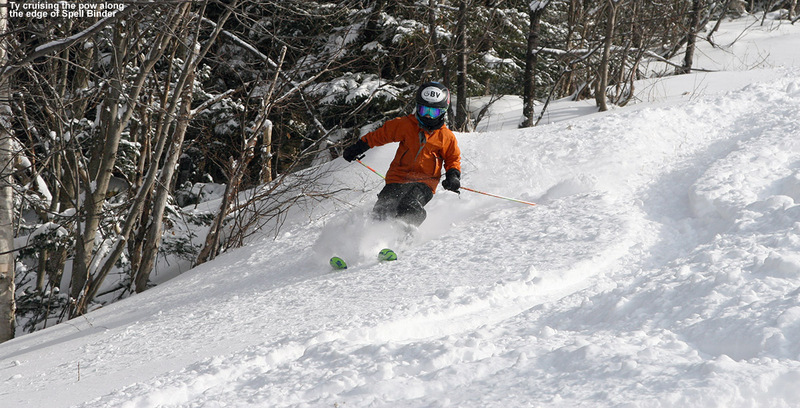 It’s still a little bit below average, but the mountain is skiing really well and should be in really great shape if the snow keeps up this week. Ty, finding Nemo quite rewarding today. 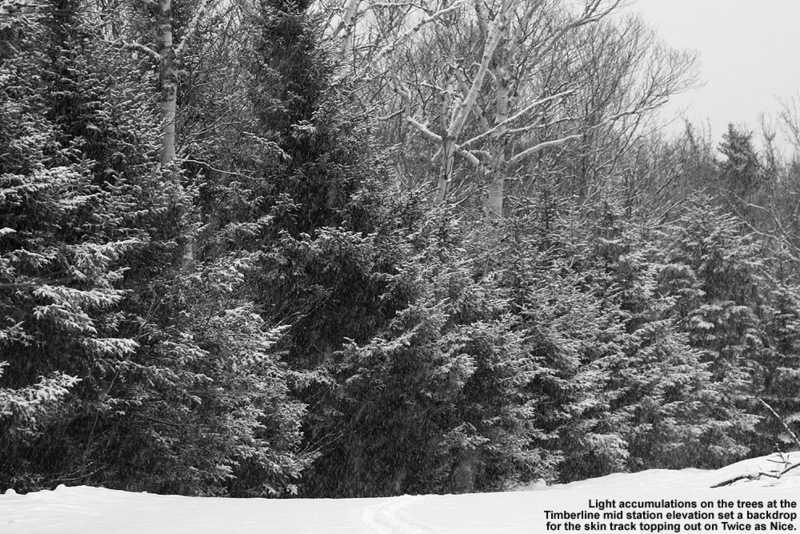 Winter storm “Nemo” dropped up to 40 inches of snow on parts of Southern New England, and the effects were much less dramatic up here in Northern Vermont, but we did pick up over a foot of snow at the house, and Bolton Valley’s snow report came in at 14 inches this morning. Being far enough away from the core of the storm, winds weren’t a big problem, but the forecast called for fairly cold temperatures with a high of around 10 F in the mountains. Today’s skiing held a little too much potential to let a bit of cold get in the way though, so we brought along some hand and foot warmers for the boys, and headed up to Timberline. Today was actually the first time this season that we had a chance to get in a Timberline-based day, and there was a surprising amount of activity at the base area when we arrived. 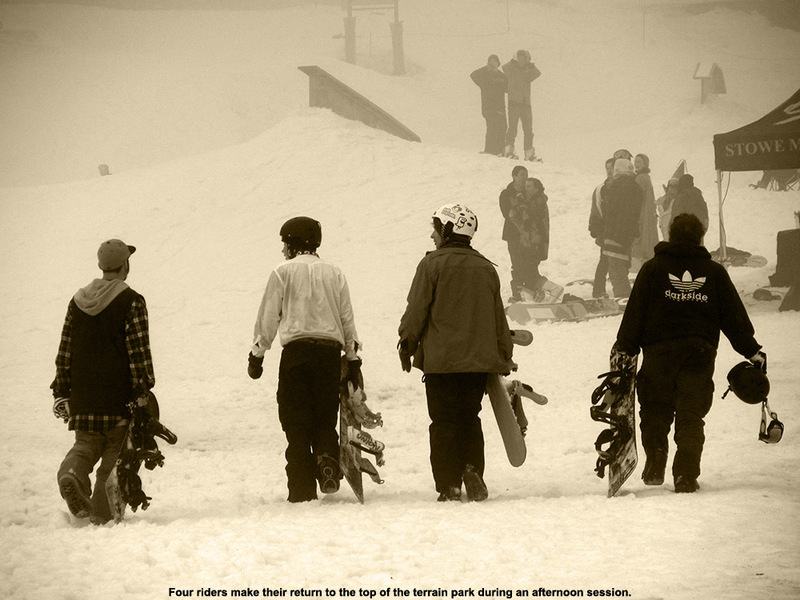 There was even a couple minute lift queue present at the Timberline Quad not too long after lift opening. Ty commented that he’d seen a sign indicating that the Vista Quad was down, and it turned out that it was down all day due to electrical issues. That made for some substantial queues of several minutes at the Timberline Quad in the late morning period, but they dissipated in the afternoon. As for the skiing, it was a decent day with plenty of powder, but certainly nothing epic. We checked out Spell Binder, which had some coverage issues on the headwall outside the center strip where they’d made some snow. 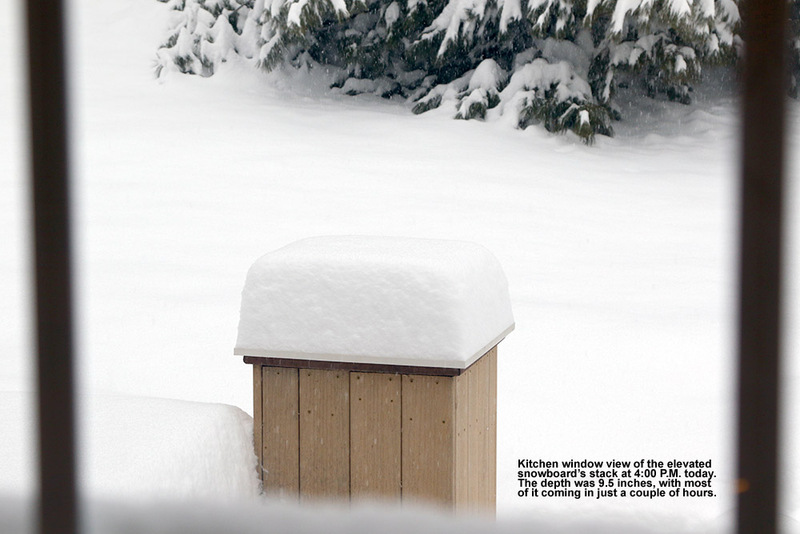 There were also some massive death chunks, some that were the size of basketballs, which were left over from the snowmaking in the transition zone between the natural and manmade snow. They had groomed most of the lower part of the run, so powder really wasn’t as plentiful there as it usually is. 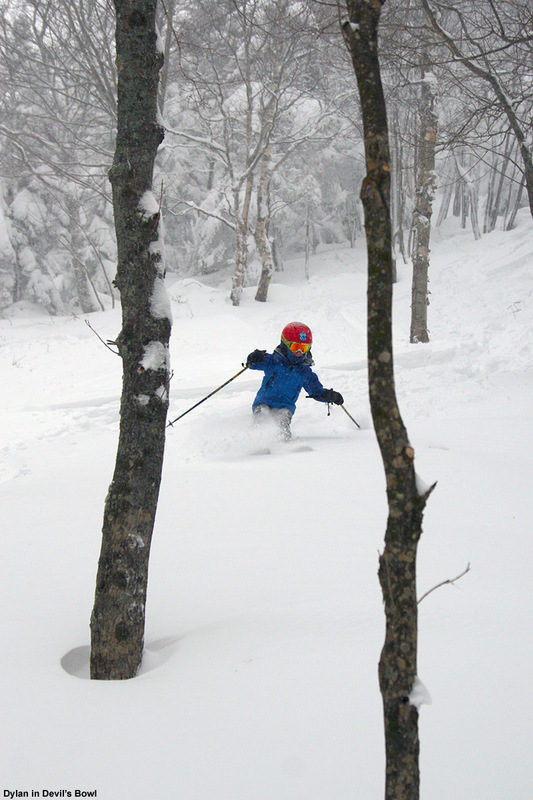 We did find some very nice powder turns in the Corner Pocket Glades though, with first tracks through a good part of that area. 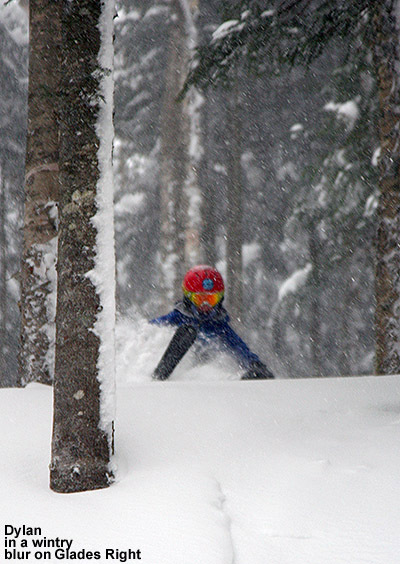 We also found some great fresh snow in the KP Glades and the Sure Shot Trees. Twice as Nice really needs one more round of base building, and that’s the case with a lot of natural snow terrain down in the lower Timberline elevations. 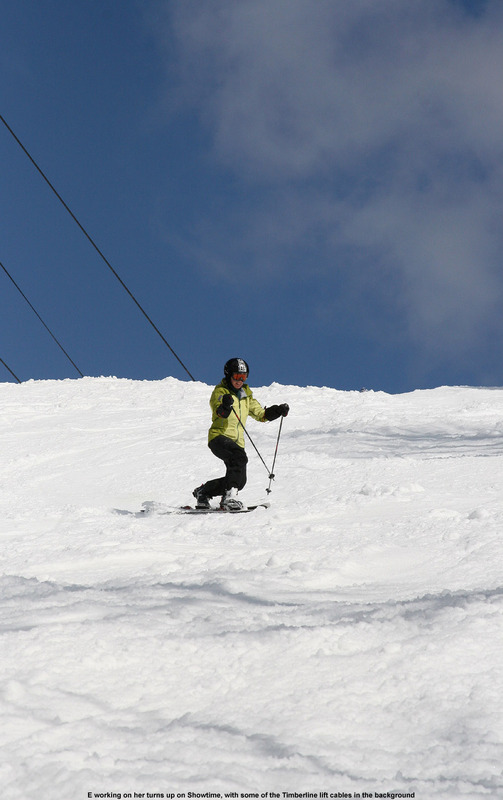 The turns are generally fine, but you need to be on your guard to avoid any spots where coverage is a little low. The off piste is skiing well because it gets more minimal traffic, but it would be nice to have another couple feet of base there to better cover up underlying objects. We’d occasionally bump something under the snow today where we typically wouldn’t expect to find anything. We never ventured over to the main mountain with the Vista Quad not operating, but the base depths there generally seem sufficient to avoid those types of issues. E glides through some of today’s fluff deposited by Nemo. It was definitely fun being back in the Timberline groove today, we had an early lunch and the lodge was moderately busy, but there was still ample space. Some of us did a little rating of the overall skiing when we were discussing things at the end of the day – Dad gave it a 5 out of 10, and Ty gave it a 6 out of 10. A couple more decent storms will get those lower elevation Timberline trails fixed up, and it looks like the next one could be coming in Monday. February is becoming a lot more active in terms of winter storms, which is a nice change from the relatively dry January period that we went through. 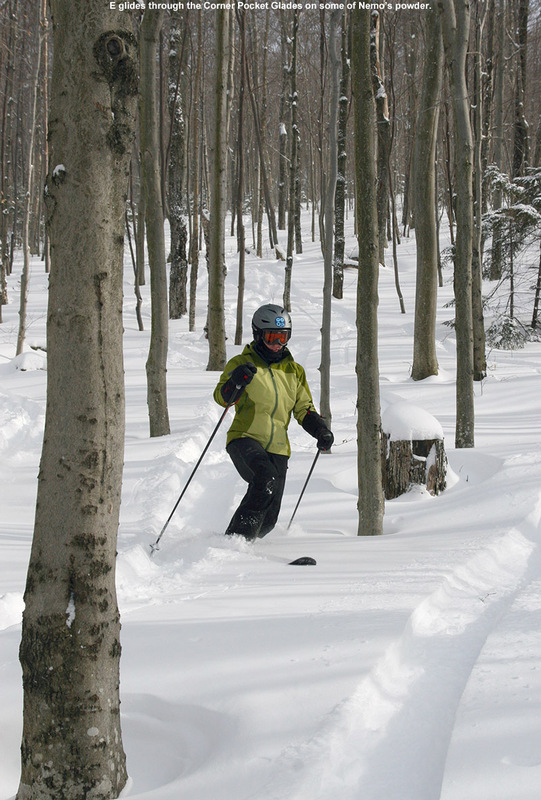 We’re looking forward to the upcoming stretch of skiing at Bolton Valley. Flakes from the current Nor’easter appeared here at the house in Waterbury as of 11:39 P.M. yesterday evening, and the snow came in so quickly that we’d picked up roughly 2 inches in the first hour. 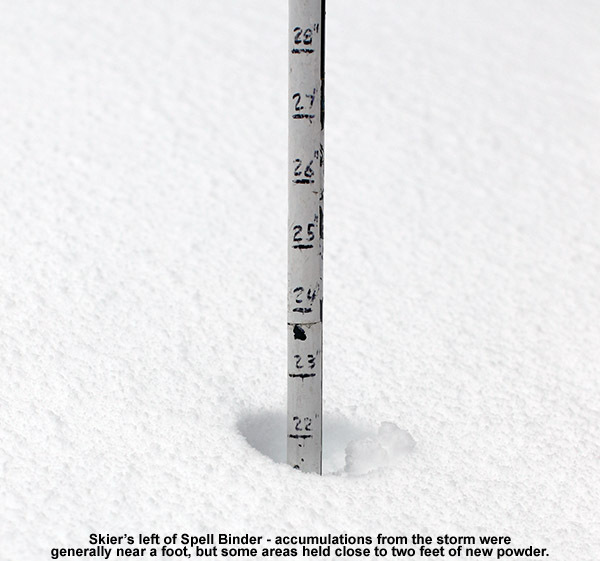 The snowfall didn’t maintain that rate all night, but there were 4.8” on the snowboard this morning at 6:00 A.M., and by noon the storm total was 10.5” here in the valley. I cleared a few swaths in the driveway with the snow thrower, and then we headed up to Bolton for some afternoon turns. It wound up being just Dylan and me making the trip, because Ty was being a bit sassy, and Mom had to put her foot down and keep him home. Snowfall was running in the inch per hour range up in the village, and there was some wind of probably 10-15 MPH, but it must have been well down from what was out there earlier – the Vista and Snowflake lifts had been down on wind hold in the early morning, but by mid morning the winds had let up enough to get them going. Since it was mid afternoon by the time of our visit, we grabbed a vacant spot in the top tier of the village parking lots, but it still only looked like three tiers had been filled anyway. “My 6:00 A.M. and 12:00 P.M. 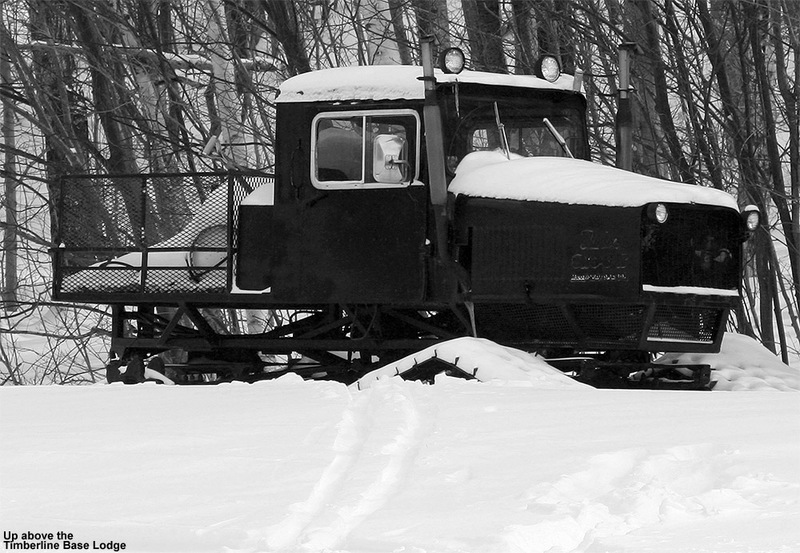 Since Dylan saw that the Snowflake Lift was finally open for the season, he immediately requested a run on that to start things off. We decided on a route through the Butterscotch Terrain Park, which isn’t actually a park yet, but it’s open for skiing. 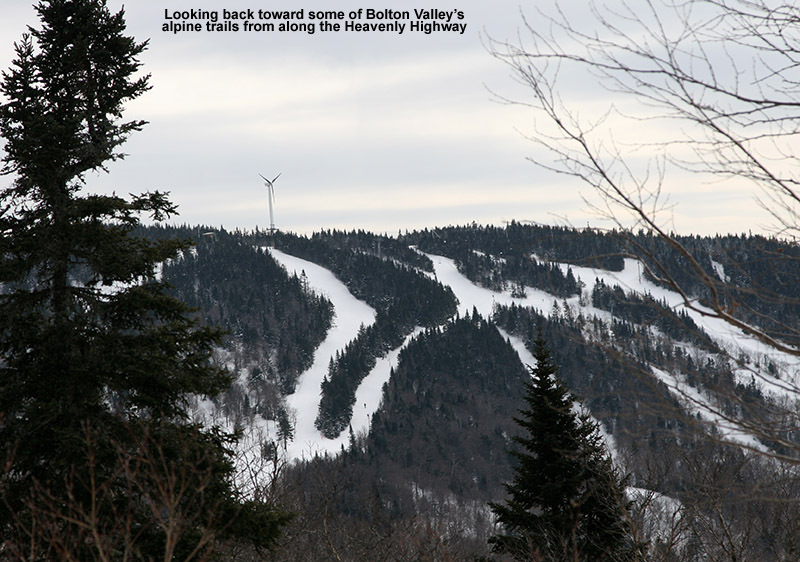 Today’s update on the Bolton Valley website was letting folks know that the park was open even without the features, and that it was offering up some nice powder skiing. Today featured a somewhat uncommon east wind, so it was at our backs on the descent. We still found a couple of wind scoured spots in the terrain park, but in general it was smoothly resurfaced by the dump of new snow, so I think the easterly wind was a plus in that regard. 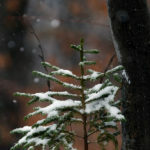 My 6:00 A.M. and 12:00 P.M. analyses down in the valley indicated that this snow was settling down in the 7 to 8% H2O range, but it seemed to ski heavier than that – possibly due to the wind. 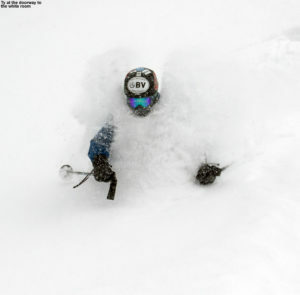 It also may have seemed a bit heavy due to the super dry Champlain Powder™ that we skied on Sunday. This snow is definitely substantiating the base though, so it’s a big win in that regard. Like he’d done on Sunday, Dylan decided to closely follow my tracks in the powder, and it really worked out well for him in areas where he might otherwise bog down and lose speed. He seems to be having a lot of fun with the technique, and I think he’s learning a lot about line choice and all that. For the next run it was my choice of lift and trail, and I chose the Vista Quad. For my trail I wanted to check out Devil’s Bowl, one of the areas that we worked on this summer with the glade crew. It took a bit of re-orienting and thinking to get myself there, but I found it just as I’d remembered. The snow was wind protected, but still skiing more like medium weight powder than I’d expect. The turns were very nice though, and it’s going to be fun exploring that terrain this season. On the lower mountain we got into the Enchanted Forest – coverage is decent but they could still use a bit more to cover up brush and roots. 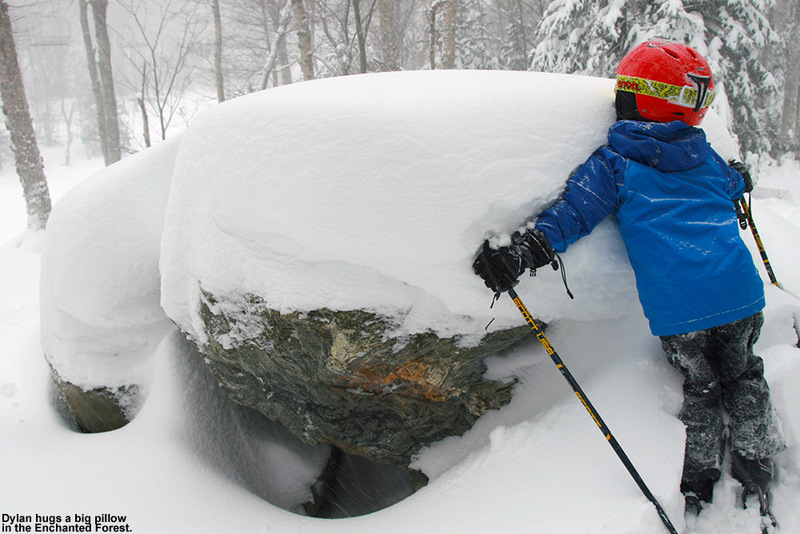 The latest snow is stacking up with some loft though – as we pulled out of one line in the woods and hit an open area, we found ourselves behind a huge boulder with a cap of snow that made it look like a mushroom. Dylan thought it was pretty cool, so I snapped a photo of him with his arms stretched out around it. Dylan went with the Mid Mountain Lift for his next run, and I introduced him to Glades Right, which he approved of since he wanted to go that way anyway. Traffic had actually been pretty light in there, so Dylan got a nice steep, untracked line. He really ripped that up, including the roll over at the end that dropped right out of sight. We headed through Nixon’s and at the bottom of the mountain we took a powdery Lower Fanny Hill, dropping us right out at Wilderness. We’d hit everything but the Wilderness Lift by that point, so it was the obvious choice for my run. On the lift ride, Dylan was definitely starting to get cold, so we made it a short run by getting off at the mid station. 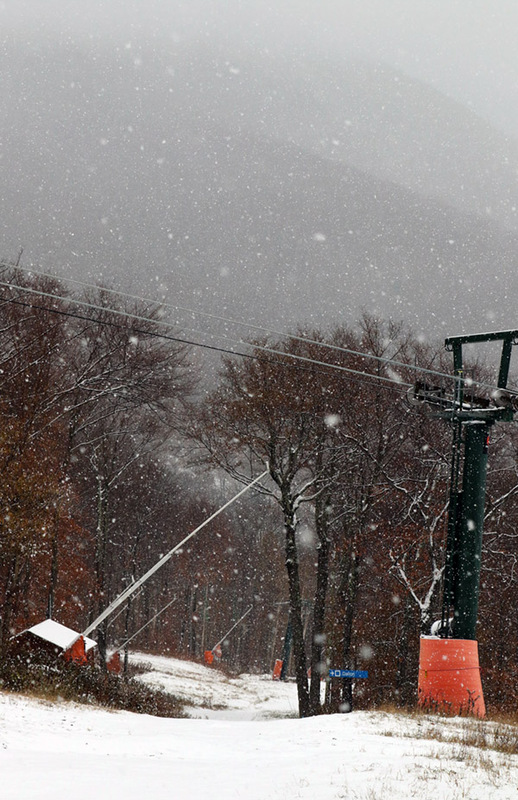 We checked out Andy’s, which has seen a similar level of traffic to Glades Right. The snow was good, the coverage was good, and it was fine way to end the afternoon on the slopes. Dylan had been a trooper out there in the blowing snow, so we headed into the base lodge and I said that we could get something to eat. 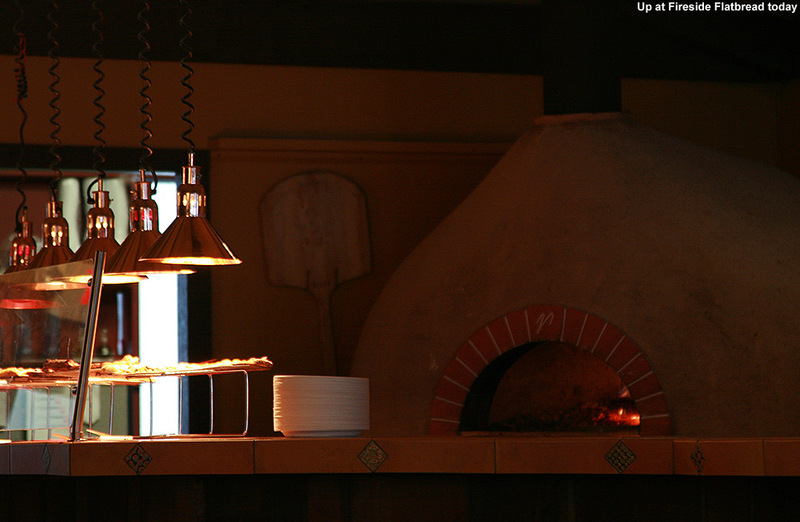 He was up for some pizza at Fireside Flatbread, and they’ve currently got it isolated from the rest of the upstairs lodge seating, so it made a great place to have a slice and relax as we talked about the afternoon. 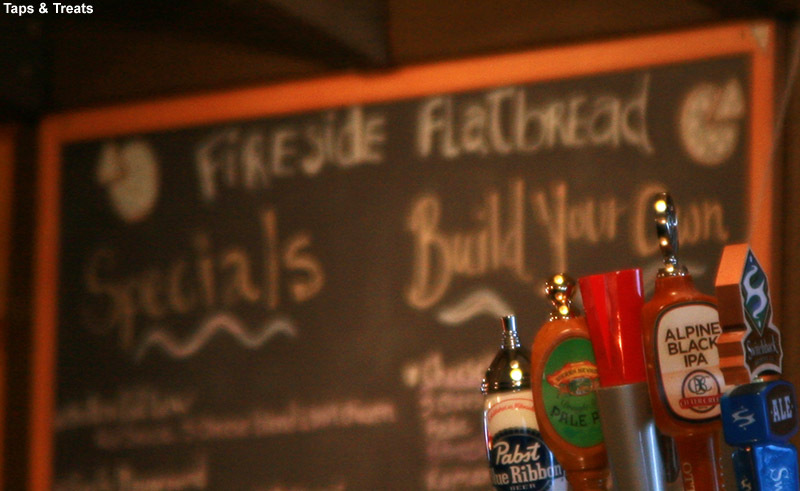 I’m not sure when the last time was that I’d had their pizza up there, but the crust was really good – definitely some quality flatbread crust, probably right up there with The Blue Stone, which is the new pizza place right in the center of Waterbury. We had an interesting chance encounter at the end of the day when we gave a ride to a couple visiting from Minnesota. They had parked their car down at the Smilie Memorial School because they hadn’t been able to make it up the hill. It turns out that the woman, Ruby, had worked in one of our labs in the Biochemistry department at UVM a couple of summers back, so the rest of the ride I was able to catch her up on people she knew. She’s obviously got ties in the area, but it still made it feel like small world. Overall it was a fun afternoon ripping up the powder with Dylan – all the lifts were walk on, probably due to the storm and the fact that the general message was to stay off the roads unless it was important. We didn’t quite adhere to that, but a few miles of driving isn’t too bad, even if the roads are a little snowy. It’s great to be back on the slopes after a few days off for the holiday, hopefully the snow gets freshened in the coming days and we can get some more good outings.